I’m making ham for Easter dinner this year, and I’m relatively new to this whole cooking thing. Any tips on how I can do this safely? Easter falls on April Fools’ Day this year. If you want to make sure you don’t prank your guests with a stomachache, there are some food safety rules you can follow to ensure a safe, delicious meal. Because ham is one of the traditional meats served at Easter, let’s start there. ing salt, sodium or potassium nitrate, nitrites, and sometimes sugar, seasonings, phosphates, and cure accelerators to pork for preservation, color development, and flavor enhancement. It is important to know whether your ham is ready-to-eat or requires cooking. You can find this information clearly labeled on the package. While many hams purchased from the grocery store are cured and sold as fully cooked, make sure you check whether the ham you’ve chosen is fully cooked, or fresh and raw. odSafety.gov, some hams have the appearance of ready-to-eat products, but they might, in fact, require cooking before eating. Those hams should be cooked to an internal temperature of 145 F and held before slicing or eating for a three-minute rest period. Hams from federally inspected plants that are cooked can be eaten cold or can be warmed to an internal temperature of 140 F or more, according to FoodSafety.gov. efrigerated and discard any with cracks or that are visibly dirty. Salmonella can be found on both the outsides and insides of eggs. One way to reduce your risk of Salmonella exposure is to purchase in-shell, pasteurized eggs. Illness, a Chicago-based nonprofit public health organization. Then, run cold water over the eggs and store them in the refrigerator until you are ready to decorate them. 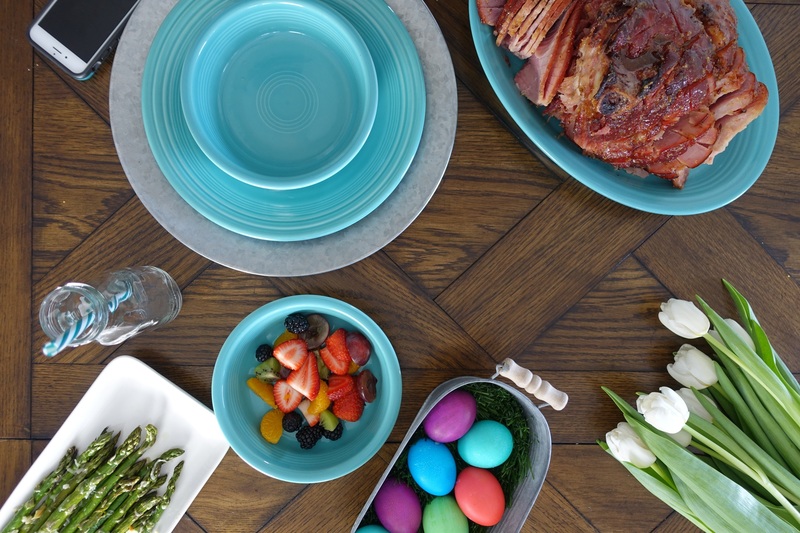 Use food coloring or food-grade dyes to color eggs if you plan to eat them. Boiled eggs can be safely kept out of the refrigerator for a maximum of two hours before they become hazardous to eat. If you’re hosting an egg hunt, that two-hour window includes the time it takes to both hide and find the eggs. Boiled eggs can be stored in the refrigerator for one week. After that, they are unsafe to eat. Lastly, do not eat hard-boiled eggs used for an egg hunt or as decorations if they have been at a temperature above 40 degrees for more than two hours. ← Binge Drinking — How Much Is Too Much?